Admission €5 plus a free glass of wine. Proceeds to Ardara Day Centre. The GAA Club have organised a Heart Screening event at the Clubhouse on this Saturday 31st March from 11am to 1pm. It is being carried out by specialist trained personnel in the fields of Clinical Physiology and Nursing. Cardiac Screening is about probability and decreasing your risk of suffering sudden death. The facility is open to anyone aged 14 years and upwards. Anyone aged between 14 and 16 years must be accompanied by an adult. The cost is €50. Booking is essential and there are some places still available. To book please text Club Secretary Mary McHugh on 087 6878614. A great opportunity to avail of this facility. There will be a Sets Ceili in the Heritage Centre on Easter Monday 2nd April from 4pm to 7pm with music by Glenside Ceili Band all the way from Longford. This is sure to be a great afternoon’s dancing so everyone is welcome to come along. 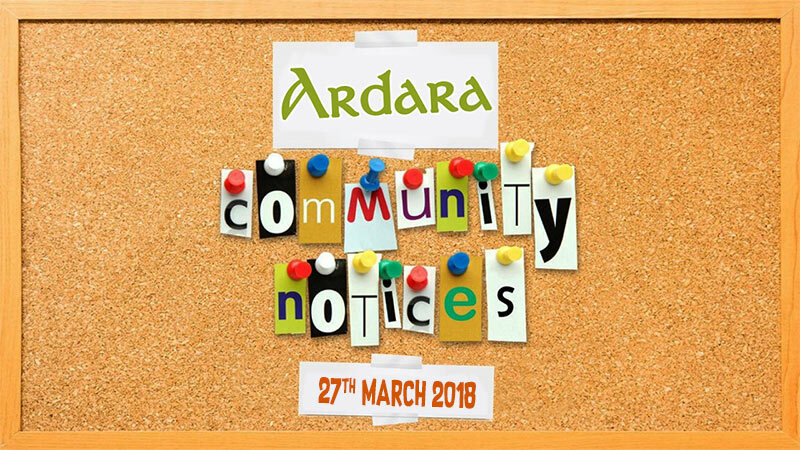 Funding of €5m under CLAR 2018 has been announced, which may be of interest to various Community Groups/ Organisations and Schools within the CLAR Areas. See our previous post for further information and application forms.